Criminals have gotten pretty good at making fake Web sites (for PayPal, eBay, Facebook, etc.) look like the real thing. But what they can't fake quite as easily is the location of the Web server that's hosting their fraudulent site. You might be looking at a perfect replica of, say, Bank of America, but if the site is hosted in Uzbekistan, it's a good bet you shouldn't input your password. Flagfox for Firefox makes this kind of detective work simple: it determines the Web server's physical location and pastes the corresponding country's flag at the end of the address bar. Clever! If you're wondering how it works, Flagfox bases its flag choice on the actual location of the server you're connected to, rather than just the nationality of the domain name--which may be different. After installing the plug-in and restarting Firefox, just head to any site and you'll see the flag at the right end of the address bar. If you click the flag, you'll get a new tab containing detailed geographic information about the site. 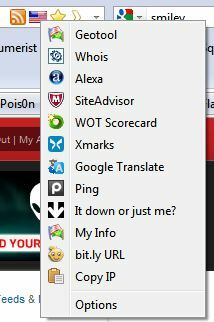 If you right-click the flag, Flagfox pops up a list of other handy tools, including Whois, SiteAdvisor, Web of Trust, and URL-shortener bit.ly. Head to the settings (via Tools, Add-ons) for the plug-in and you'll find a dozen or so other options you can add to the list. This is a great little addition to Firefox, one that combines convenience with added security. What's not to like?